...when the sun is shining, the birds are singing, the trees are all in bloom (sniff, sniff, cough, wheeze), and a quilter's fancy turns to thoughts of brightly colored prints. 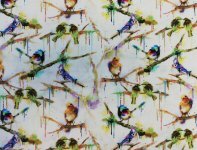 It's perfect timing to show off Color Splash, a new digital print from a new fabric design group called 3 Wishes Fabrics. The delicate color washed birds provide beautiful balance to the vibrant hues in its companion pieces. 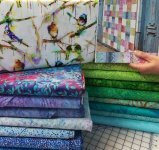 - and another of our talented fabric aficionados has big plans involving a variegated array of batiks with center squares of lively little feathered friends! What will you do? We have everything you need to make those eyes smile - no matter where you come from! And couldn't we all use a little "Luck 'o the Irish?" Kaffe Fassett Mystery Quilt Is Back On Track! 4 Pastel Kits Still Available! Good news! The 2018 Kaffe Fassett Mystery Quilt program will proceed fully intact, just as it was advertised! 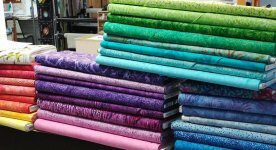 Free Spirit was bought by Jaftex, which owns Henry Glass, Studio E, Blank Quilting, Fabric Editions and AE Nathan. 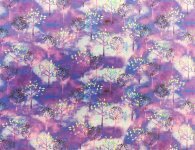 They plan to continue fabric lines under the Free Spirit name including Kaffe Fassett and Tula Pink, without interruption. Hooray! Our pastel kits are due mid- to late-March. And now that we know the program is full steam ahead we’re happy to accept your $100 down payment again. If you have not yet paid your $100 (plus tax) down payment please do so at your earliest convenience. You can even do it over the phone at 704-821-7554. Please pencil in the new date for our Mystery Quilt Kick-Off Party: Thursday, March 22, 5:30-8pm. You can pick up your first month of the Mystery and meet your fellow Mystery Quilters. Light refreshments provided. Be advised the date may change depending on when our kits arrive. As always, please call us if you have any questions. 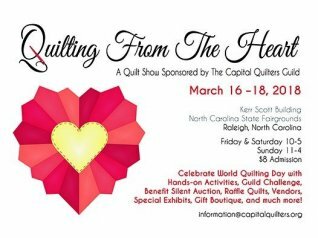 More than 180 judged quilts on display, a Special Exhibit of Carolina Lily quilts, local and regional vendors, raffle quilt and raffle basket prizes. 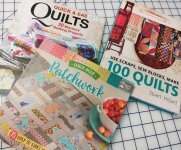 Click here for more information Charlotte Quilters Guild. Looking for inspiration? We have fun new books hot off the presses to spark your creativity! March 8-11 Only 2 spaces left! Treat yourself to a relaxing 3-day getaway in the picturesque mountains of North Carolina. No cooking or cleaning, just fun and friendship-you deserve a little pampering! We call it the Pajama Party because you can roll out of bed and come to quilt class in your jammies! And the comfortable, beautifully decorated retreat is outfitted especially for the needs of quilters. Our featured project for the March retreat is Rainbow Swirls. This is a curvy log house quilt and should be lots of fun. 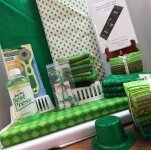 All retreat supplies are 15% off at Quilt Patch Fabrics! For more information contact deborahquilts@hotmail.com. Go to quiltpatchfabrics.com/classes.htm for more details on all of our classes. To register call us at 704-821-7554. Have you wanted to make a beautiful Lemoyne Star but thought it would be too hard? This class uses Deb Tucker's rulers to make this quilt easier than you think - without any Y-seams! This lovely pattern calls for one Jelly Roll and your borders, but for a beautifully intricate look try using just 4 fabrics. No fancy ruler required! It may look a bit complicated but really it's not. Besides-that's what classes are for! Learn to sew gentle curves with ease! A simple design creates movement in this lively contemporary quilt. The twirling ribbons practically burst from the surface! Learn an easy way to make a beautiful, accurate Pineapple block.